Asst Prof Chin Chee Tang, Senior Consultant, Dept of Cardiology, NHCS shared tips on measuring blood pressure and highlighted that readings taken at home will vary and there is no need for patients to be alarmed.  Taking your blood pressure regularly helps you ensure your heart will continue to tick normally. Hypertension is far too often ignored. As it is largely symptomless, many people do not even know they have the condition, though it can lead to serious health problems such as heart failure, stroke, aneurysm, and kidney damage. But last month, the spotlight was shone on the condition, when the United States adopted stricter blood pressure guidelines that led to nearly half of Americans being labelled as having hypertension. Although Singapore did not follow suit, the change forced people here to be more wary of the condition. In the US, high blood pressure is now defined as 130/80 mmHg (millimetres of mercury) or greater. This is lower than the previous guideline of 140/90 mmHg. A lower cut-off level means more people will be alerted to the dangers of the condition, and hopefully be motivated to do something. Based on the new definition, 46 per cent of Americans are now considered to be suffering from high blood pressure, up from 36 per cent. And a larger proportion of them are younger people under 45. 1. WHAT DO THE READINGS MEAN? In Singapore, as in Australia or Europe, you are considered to have high blood pressure if your reading is 140/90 mmHg or more. The top value, the systolic blood pressure, indicates how much pressure the blood is exerting against the artery walls when the heart beats. The lower value, the diastolic blood pressure, indicates how much pressure the blood is exerting against the artery walls while the heart rests between beats. Studies show there is a doubling of the risk of death from ischemic heart disease and stroke with every 20 mmHg increase in systolic or 10 mmHg rise in diastolic pressure. Still, doctors say it is important to note these numbers are guidelines. They are there to separate the low risk group from the high-risk one. 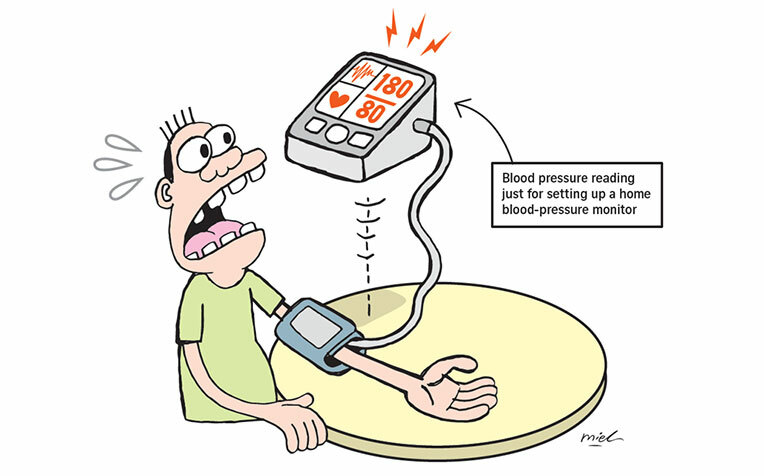 Blood pressure also changes in response to activity, stress and one’s surroundings. For instance, it can shoot up while one is getting it measured at a doctor’s office. “There is no suggestion that you will have a cardiovascular event immediately if you are above the norm,” said Dr Arthur Tan, a cardiologist at Gleneagles Hospital. The main advantage of having it measured is to indicate if you are in a higher-risk group, and should take steps to lower the risk, he said. Indeed, the new US recommendation was made largely in response to the results of a federally-funded study called Sprint, which was published in 2015. It was done to see whether treating blood pressure to a target systolic pressure of less than 120 mm Hg is superior to treating to less than 140 mm Hg, which was the commonly recommended target during the time the Sprint trial was conducted. The study included data from 9,361 adults aged 50 or older with systolic blood pressure of 130 mm Hg or higher and at least one additional cardiovascular disease risk factor. It showed that a systolic blood pressure of less than 120 led to a 25 per cent reduction in the incidence of heart attack, heart failure and stroke, and a 27 per cent drop in the risk of death. So, there is a real gain in working to get one’s blood pressure down. Patients now recognise that a reading of 130/80 mmHg is considered a disease state in the US, said Professor Tan Huay Cheem, a senior consultant cardiologist and the director of the National University Heart Centre Singapore. The US guidelines offer doctors the chance to further educate the public on the risks of hypertension. “Here, we recognise that a 130/80 mmHg reading is abnormal but we don’t call it hypertension. The term is high normal,” said Prof Tan. “When we call something hypertension, it is a chronic illness. The new guidelines will also change the way doctors approach hypertension. Before, doctors may not give medication to this group, even if their readings were borderline high. It is about assessing the benefits of treatment to the patient, after taking into account his individual cardiovascular risk, rather than diagnosing him based on a specific reading. Hypertension treatment remains the same. The focus is still on lifestyle measures, and then with medication if required. “Previously, if you have a blood pressure reading of 138/88 mmHg, you will not be considered as having hypertension and there would be no need to treat it,” said Dr Arthur Tan, a cardiologist in Gleneagles Hospital . But now, with the changes in the US, you can be considered to have the beginning stage of high blood pressure or “Hypertension Stage 1”, he said. You will thus be asked to make lifestyle changes to lower your cardiovascular risk, he said. 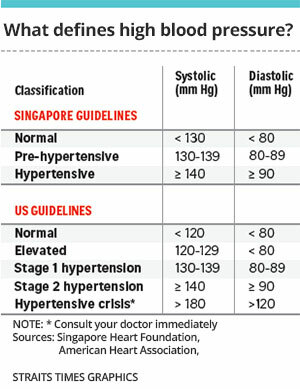 Hypertension is an important cause of heart attack in Singapore but most people with high blood pressure show no signs or symptoms, even if their readings have reached dangerously high levels. Health Promotion Board data from 2015 shows 74 per cent of patients who have had heart attacks had hypertension as a risk factor. Hypertension is an even more important risk factor for stroke than other risk factors, said Professor Tan Huay Cheem, director of the National University Heart Centre Singapore. If a person has high blood pressure, this puts extra strain on his heart and blood vessels, which can weaken or damage them. The higher the pressure, the higher the risk of heart attack and stroke. High blood pressure can also cause kidney disease, and is linked to some forms of dementia, says the British charity Blood Pressure UK. It can also lead to sight and mobility problems. And if you also have a raised level of cholesterol in your blood, your risk of heart attack or stroke is much stronger than if you had just one or the other. 4. HOW DO I LOWER MY BLOOD PRESSURE LEVEL? Doctors generally prefer to get patients to adopt lifestyle changes before they turn to medication. For instance, if you are overweight, weight reduction is the most effective way of lowering your blood pressure level, said Professor Tan Huay Cheem, director of the National University Heart Centre Singapore. “A balanced diet is still key but there’s the so-called DASH diet, which is rich in fruit, vegetables, grains and nuts, that has been shown in clinical trials to help reduce blood pressure significantly,” he said. regular exercise such as walking, swimming or cycling, done at least three times a week. “Each of these measures on its own may not have a very obvious impact on blood pressure levels, but they all have an additive effect and so should be adopted concurrently,” said Prof Chin. “The good news is that these measures will also help to optimise blood sugar and cholesterol levels, which will also have an overall beneficial effect on our health,” he added.